You can view any route from plotaroute.com in glorious 3D using Google Earth. You can even watch a fly-over the route! Follow these instructions. You will first need to download and install Google Earth if you don't already have it. It is free to download and install. You can also download the Google Earth app for mobile devices from your app store and view the route in Google Earth on your smartphone. View the route on plotaroute.com. Select Download from the menu above the map. Then select KML as the GPS download file format and choose whether you would like to include mile/km markers. Once the file has downloaded, simply click on it to open the route in Google Earth. 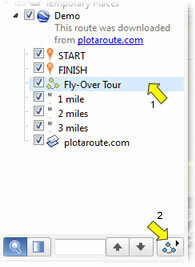 You can view an animated Fly-Over the route by clicking on the 'Fly-Over Tour' item in the left panel (arrow 1 below) and then clicking the Play Tour button (arrow 2 below). You can alter the viewing angle and viewing distance in the Touring tab in Google Earth Settings/Preferences - a viewing angle of 70-80 degrees will give you a good view of the hills and the route comuing up. A viewing distance of around 300m usually works quite well.